WARNING !!!!!!!!!! GRAPHIC PHOTOS IN THIS POST!!!!!!! You will also note that I am happily white, no suntan, no sunburn, and no need for it. a smiling, happy, very white and NO TAN, me! If you have been keeping up with this series, you will recognize the next photo from Part I HERE. This is how my MOHS surgery was left and if you recall from Part II HERE, my journal left off with me leaving for the ocular plastic surgeon, ready for the next part of my journey and his part in closing up the ugly hole left by cancer. And so when 2:30 rolled around, we left for the plastic surgeon’s office which is 45 minutes away. Why did I have to have this procedure done in 2 different offices? The first surgeon does not close up eyes, that is for a specialist to do, so that is why I was referred to the plastic surgeon and finding myself en route to this office. Mind you, the local anesthesia has worn off by this time so I was pretty uncomfortable and just wanted to get there. Also, I did not know what to expect but had a terrible hunch a skin graft was in order. EEEK! I remember being called back and sitting in the chair and watching the doctor remove the patch to unveil the hole. I knew he wasn’t expecting it to be this big and was trying to read his expression as he removed the bandage. He was REAL good. No look of surprise or shock even though he did say he wasn’t expecting it to be this big. Trust me, neither was I. I think inside he was saying WHOA BAAAAAABY! So he told me to close my eyes and he starts pinching my eyelids and feeling for how much skin would be needed. It was at this part that I started getting grossed out. (My father later told me he was really hoping this was not going to be the way I got the extra skin). I asked him if he was going to take the skin from my eyelids. He said normally that is where it is taken from because it matches the skin under the eyes. He was also trying really hard to find extra skin at the corner of my eye as he was pushing it over toward the hole, but to no avail, it was too taut. Ah yes, the joy of youth but in this case, it was working against me. You need to know that I was getting grosssed out by the second, AND, my mind was racing because I had promised a delivery of draperies and cornices to be installed on the 22nd of December to a new firm I have just contracted with. I could work with one eye no problem, but to not have both for who knows how long? I couldn’t do it. So I suggested to him if we didn’t have enough skin from my eyelids, which was turning out like that might not be an option anyway, could we take the skin from my ear area? I told him I had no problem hiding the scar with my hair. He took a look and said that was definitely an option if I had no problem with it. I told him no and to proceed. So, his instructions to me were: before we get started if you have to go to the bathroom now is the time because when we get started, there is no turning back. Now, I’m at the age where the bladder has been playing tricks with me and when I gotta go, I gotta go! Uh oh I thought, I am cooked because I had a cup of tea before coming and with my nerves being what they are, I’m doomed. So I took a deep breath, went to the bathroom and hoped it would be the last time I had to go in an hour or so. Turns out that fear and anxiety are great pee stoppers! It worked for me. I laid down on the gurney and his assistant prepped me for the surgery. She made sure I was very comfortable, draped my hair away from the face and ear area with those paper sheets and secured it tightly, cleaned the area well and disinfected it and then shaved me at my ear area because of the hair. There is no hair in the skin right under the eye. *remember this point because later on I had a revelation. He started numbing me up at the ear area real well. Then as I lay there not feeling anything but tugging, all of a sudden I heard what I thought were scissors cutting something. And then it dawned on me: he was cutting my skin away after the intial incision! And it was at this time that I wished I had earplugs in so I wouldn’t have heard it. I had to talk to myself again because I can’t go pee if I had to, and now I think I’m going to throw up because of what he was cutting. I couldn’t help but think of that movie where the guy skins all his victims and makes a suit for himself with their skin! Yes, amazing where the mind goes and now here I am being skinned alive! AAAAHHHHHH! After he cut the skin off, I heard him drop it in a jar of liquid to wait till he was ready to use it on my eye. Then he proceeded to sew me up. I asked him what kind of needle he uses since I sew too. I told him I have curved needles to get into hard places and was that what he was using? He confimed and so we had a discussion about the different threads. Only his needles have the thread attached and that is why I could feel him stitching and then knotting off after every stitch. Good thing he didn’t need to rethread the needle every time. This took about a half hour and I could tell he was very thorough about his stitches. Didn’t he do an awesome job? He disinfected me real good again even though his assistant did a fantastic job before him. I liked that because it told me he was real careful about contamination. And I am a germ- o- phobe. He proceeded to numb me up real good and I knew this was going to take longer than the first procedure. He then took the skin he removed from my ear area and again I heard cutting. So I asked if he was cutting the graft to size. He explained to me that the skin at the ear area is thicker than the skin at the eye so he was cutting away at it, removing the fat and making it thinner. Hmmmmm…I say and then tried to focus on the lavender field in Provence that I toured. Anything to get me away from what I was laying here experiencing now. Fat? Being trimmed away from my skin? Too much to digest. I’m smelling the lavender…….I’m back in the field…..I’m bending over and taking a rock for a souvenir…. He had to cut the graft in two sections so he was placing the first graft at the bottom and sewing it down, then I heard him snipping away and fitting the top piece of skin to the top. He sewed that into place then he sewed the two sections together in the middle. I was getting really restless at this point and was moving around trying to get into another position, keeping in mind he had a needle at my eye. His assistant asked if I was ok which she did on a regular basis and I was fine. (Keep telling yourself that Tammi, it will get you far my girl) And then he was done! Whew! So after getting the wound care instructions and a prescription called in for an opthalmic antibiotic ointment, we are on our way. By this time, rush hour traffic is in full form and the local is starting to wear off to the point that I’m squirming and very uncomfortable but trying to grin and bear it. 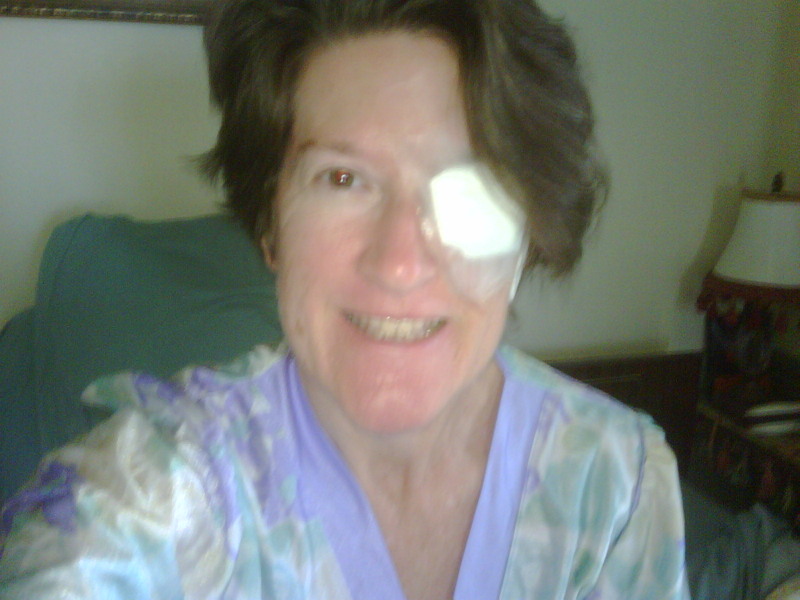 The stinking patch was uncomfortable as my eyelashes were getting caught in it and the sutures. Almost an hour and a half later I arrive at home. My day started at 8:30 am and my arrival at home was 6:30 pm, a long day indeed to not be on anything to calm the nerves a bit. Two of my friends were providing dinner for me, so I sent them a text to let them know I was home but in all honesty, I wasn’t that hungry. However, once they got here and I saw what dinner was, suddenly I had the urge to eat. I showed them the pics of the surgery and then they were on their way. I had a delightful dinner and then went to bed because I just knew I was going to sleep like a baby! I was exhausted mentally, physically and emotionally! Or so I thought. I had to sleep sitting up because of the eye needing to be elevated which isn’t a problem for me but I was experiencing a fair amount of pain. Betweeen the cutting and cauterizing of the skin, then needle punctures and sutures, I was a sad kitten and Tylenol was what I could take for pain. Hindsight says get the good stuff next time. It turned out that I got NO sleep at all, I couldn’t find a position and the pain was making me want to scream. I toughed it out that night but was not a happy camper when I awoke, or wait, I was already awake, wasn’t I? And then it hit me: OH NO! I HAD SKIN TAKEN FROM MY HAIRY EAR AREA SO DOES THAT MEAN MY GRAFT AT MY EYE WILL HAVE HAIR STICKING OUT OF IT? *remember that little footnote I told you to remember? This is why! So I made the best out of a crappy situation and put the frozen peas on my eye like the doctor said to reduce the swelling and keep the area from bruising as badly. I was warned I would be turning all sorts of colors but thankfully, the only color I turned was yellow. I had grandiose ideas of reading since I was bedridden for the next two days but that backfired on me because 1) I wear glasses which did not fit over the patch 2) I’m blind as a bat! 3) I could not focus because of the pain. So much for that. Now I’m really bored and going nuts because there is nothing for me to do. I have no TV but I do watch some TV on my computer but I got a serious headache trying to type on the laptop because I couldn’t see. Then, I had to hold the screen right up to my eyes to see what I had just typed, which resulted in the headache. Forget it! I’ll choose to be miserable. Then a friend on Facebook suggested audible books. Oh duh, why did I not think of that beforehand? Too late now. This is me the next day at lunchtime. I mustered up a smile for the camera. I’m such an actress aren’t I because trust me, smiling was not on my agenda. 48 hours after surgery the patch was to come off. I could not wait. So for me that meant 5:00 pm on Dec 9. During the course of the past two days, I could feel my wound weeping, yet I could not cry because the tears stung too bad. It would only be 3 weeks later that I could cry about it. I enlisted my mother’s help since I wasn’t sure what to expect. She removed the bandages but the non stick pad actually stuck to my graft so she had to cut away at it little by little. Needless to say, that REALLY hurt! 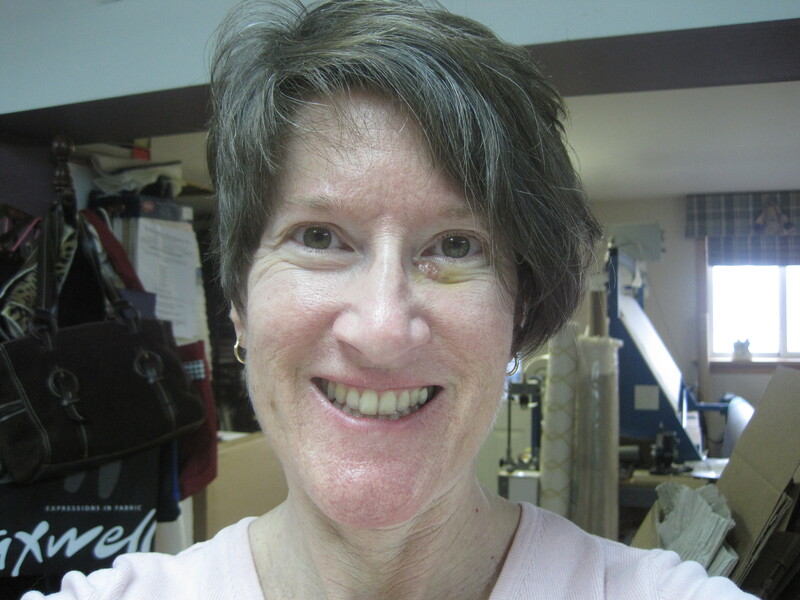 After the bandages and tape were totally off, I got up to go to the mirror and see what my new face would look like. I was all ready to wash it off and put on the antibiotic ointment myself. Let me tell you, I got so nauseaous I almost passed out! I got light headed and had to lay down on the bed. My cat who is super sensitive to what is going on with me, jumped up on the bed and got right on my chest and looked at my face and started rubbing her head on me. She stayed right with me as mom cleaned it up and put the ointment on it. We had to clean the ear area too and it had steri strips on it so I wasn’t too grossed out about it. Then, as if this wasn’t enough excitement during all this, my dad, brother and nephew came up (I forget why now, but there was a real reason) and my nephew who is only 11 yrs old had to leave because it was making HIM sick. How funny I thought that at the time. He had no qualms about telling his dad they had to go. I will give him a gold star for actually wanting to look at it because my other brother and sister had no desire to look or even look at the pics. You can see that my eye is swollen and discolored and the graft is raspberry red. That is what grossed me out because I was hoping it would not stay this color. Look how tired my eye looks! I’m allowing time to elapse between the pics even though I took pics every day to chart the progress. My next visit with the doctor would be one week later on the 14th to remove the stitches from the ear graft and the eye. Ouch! As it turned out, the sutures at my eye were too sensitive to remove so because they were the dissolving type I decided they could dissolve on their own when THEY were ready to come out. 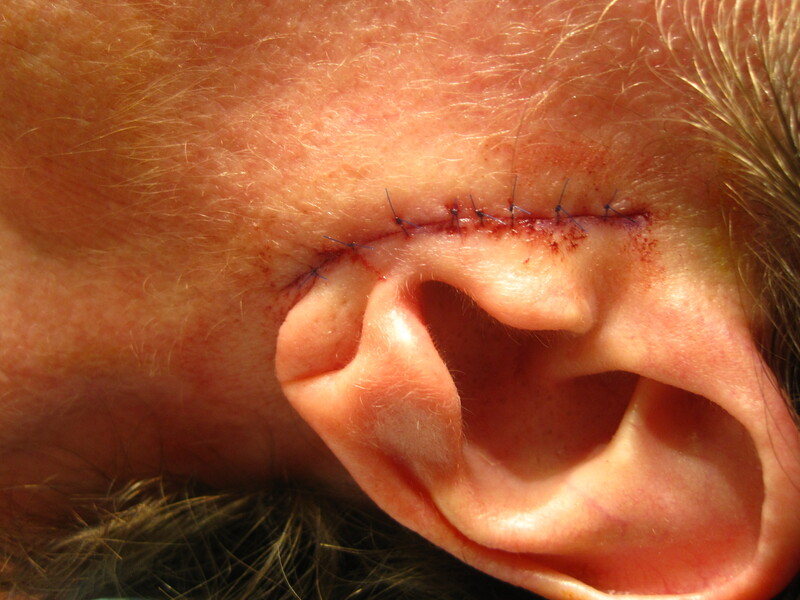 The sutures at the ear were not, so they had to be removed. What I realized during the first week was that I couldn’t laugh too hard or smile too wide because of the incision at the ear. I did in effect have a mini facelift and could definitely feel the tightness and pulling. I also became more sensitive to the cold and if only out for less than a minute, ached for hours. It took me a couple weeks to realize the sensation was that of a burning ice cube starting at my left temple and running all the way down to my jaw. Most unpleasant indeed. However, I did get that drapery job done and installed! 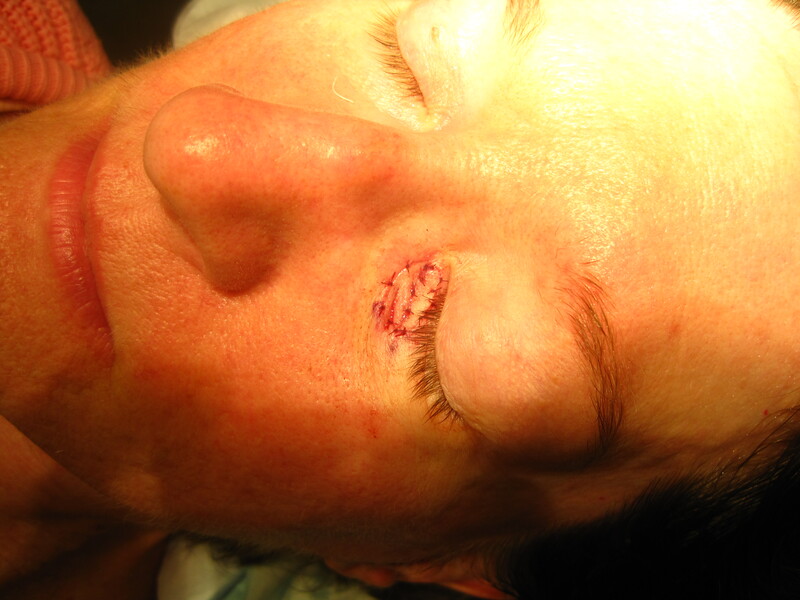 This is what the eye graft looked like 9 days later. Only one suture was able to be removed a couple days earlier at the 1 week checkup. It looks real good I think but it was starting to get a little hard. 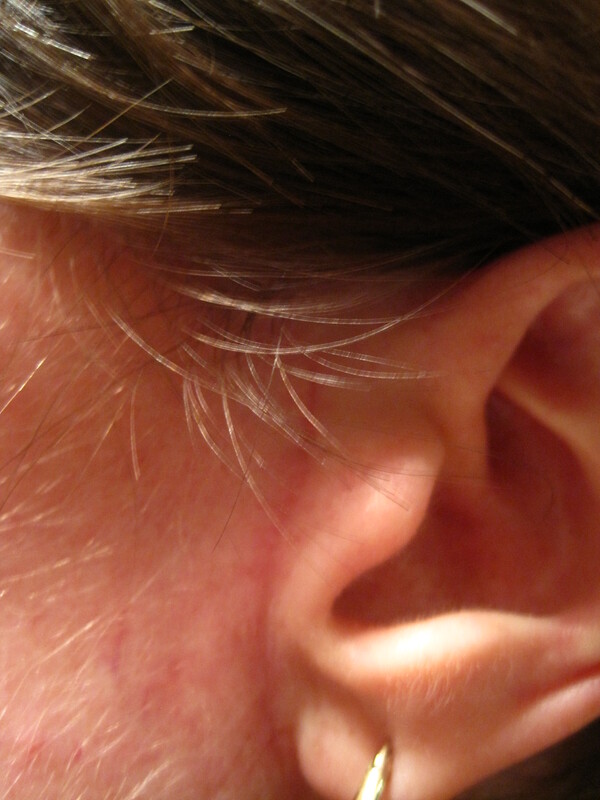 This is the ear graft 17 days later. Healing up very nicely thus far and easily hides under hair. We are now 3 weeks out with the eye graft and some of the sutures have come out on their own. The bottom half had a thin scab that fell off but the top half still has it and the color is coming along quite nicely although I’m starting to be a bit concerned about the raising of the graft itself. Should I be concerned? I didn’t know. So what does any inquiring mind who wants to know do? They Google! So I googled skin grafts and skin cancer and found these two blogs: Things Happen and Efudex and Me. I really enjoyed reading them and it gave me some comfort to know I wasn’t alone in my struggles. And yes, my concern grew because this graft indeed turned out to keloid on me and I saw the doctor because I knew it was NOT a good thing. I got keloids from prior pre-cancers being removed but never thought that this would happen on the face! After my visit with the plastic surgeon he confirmed my fears and we started putting a steroidal ointment on the graft 3 times a day with massaging for 5 minutes at a time. It turns out that I am 1 in 10,000 that this happens to and keloiding usually doesn’t happen on the face much less at the eye. Well, guess what? My dad said he knew I was 1 in 10,000 but darn it, not this way! So because I was my surgeon’s first patient to keloid like this at the eye, he had to special order the combination of steroids to be injected and I would be called when they came in. It so happens that on Friday Jan 13, I got a double dose injected right into the graft. It included a fast acting and a slow acting steroid so I sure am hoping that this does the trick but if not, the possibility of a re-do is not out of the question. I made sure he numbed me up first because I have had these before and to say they hurt is an understatement. I couldn’t imagine having this done at my eye. I’m watching my ear incision closely now too but all in all, it looks good. Here I am after the injection on Friday afternoon. I remember 5 sticks with the needle to numb me all around the site and then 3 or 4 sticks into the graft with the steroid. Again, I was talking to myself to not pass out. I’m so glad I could close my eye and not have to watch it happen. I will say this, even with a local anesthetic, once it wore off, I still experienced pain and am still feeling it. Especially when the cold air hits, I feel that burning sensation and aching. This is how bad it is raising on me. It is also pulling the skin tight too and makes me feel like I am winking or feel the need to wink to give it some slack. My eye is dryer now too. Now at 4 days after injection, I’m getting a nice yellow bruising. 4 days after steroid injection. Mild yellow bruising. However, I still have to smile because it can always be worse. I have my eyesight and fortunately while I have work, I am not having to be in and out of the cold so I have been staying put, inside my humble little abode and making the most of the situation I have. SERIOUSLY? no makeup and no hairdo? I can’t believe I’m posting this pic! I guess I have come to terms with this, huh? I will update as time goes on to see how well the injection works. I know it will take time now so I will keep you in the loop! 6 weeks after surgery with yellow bruising, no makeup and a smile on my face. Wow Tammi this is quite an ordeal you’ve been through, and working in the middle of it to boot! I love that you and the surgeon were talking needles during the procedure, I can see why you would want to put him to work, that was some very fine stitching. I hope you don’t need to repeat the surgery, and when I look at your last photo, with your beautiful smile, I barely notice the graft. Keep smiling! His work is awesome isn’t it? I would love to have seen his handiwork had this thing not keloided on me! He’s been voted best doctor for the past 4 -5 years running. I bet he can do a mean hand sewn bump interlined drapery! Yes, the job I did was that huge 22′ cornice I posted about on my biz page. Helped keep my mind from dwelling on the pain I was putting up with. My husband Terry has walked in your shoes so I have been praying for you. It was a three year process for him because he lost half his nose and they did not do reconstruction surgery until a later time. I am sending healing thoughts your way. Thank you so much for sharing the story about your husband. I can’t imagine 3 years and am thankful for this little ditty when compared to other people’s experience. What I’m noticing is that ever since I started blogging about my experience, other people are coming out with their story too and it is so comforting to talk about it regardless of the size or scale. It’s the emotional side I’m finding that leaves more of a scar and the fear of more on the way. Give your husband my best wishes please. Your story will save some else from waiting to see the doctor. If I notice anything strange on someone I beg them to go get checked. Oh Tammi, I see now what you meant about having a problem with the healing. I’m sorry about the keloid, especially after it was looking so good on day 9. I am extremely impressed that you completed a drapery job during all of this! Plus, your first picture in the lovely dress is so, so pretty. You’ve been through a lot with this. I think you are very brave, and you do look lovely in the final picture, sans makeup. With glasses on you may be able to cover up the scar. I don’t wear glasses, but I wore sunglasses a lot more than I needed to the first year, even indoors in public! yes, what a journey this has been! More than I bargained for that’s for sure. Under any other circumstance, I would have never promised a job for Christmas delivery, but back when this was all diagnosed, it was presumed to be a tiny thing that we had caught in the early stages. Even the ocular plastic surgeon thought maybe a suture or two would do the trick! So that’s why I was watching for a reaction from him when he removed the bandage. Fortunately, I had one of my previous employees come in and help me for a day with the drapery panels as they were very heavy and voluminous! And then I had the help of another workroom friend for a day when I built the 22′ cornice on site. Hindsight tells me I should’ve never committed but I didn’t know till surgery day what was to become my reality but knew that it would not be impossible to get the job done. I am waiting permission from the design firm to blog about it so look for a future posting about the scope of the job. Glasses do help tremendously in the camouflage so all I need right now is some time and space to come between me and the graft. It amazes me that such a small area has left me with more pain than my hysterectomy did! I poked my head out the door to let a cat out earlier this morning and I got an instant shot of pain from the cold. And you’re right, the contraction of the skin is making my eye more sensitive too. That was one of the concerns that the plastic surgeon had. He said right up that he did not want the graft to make my lower eyelid come away from the eye and he did a fantastic job with that. Who knew I would get a keloid? I don’t know about you, but sometimes I get the impression from people around me that this is such a small thing, I should be getting over it or that I am over consumed with it. And sometimes I think that is true too and so I’m confused at times as to how I should be reacting. Did that happen with you? There are moments when I think I need to put things in perspective and then there are moments when darn it, this thing hurts and I can’t get away from the pain! Did you have those moments too? To answer your question about not knowing how to react (sorry it took me so long), some people minimized it and made me think I shouldn’t be so concerned about it. That left me feeling odd because inside I felt like it was such a BIG deal. Other people validated that it truly was rather scary looking. I was consumed with it and wanted to get away from it! I wanted it to heal faster, faster. The first year it was very much on my mind. At the beginning I’d get a weepy feeling when I saw the wound in the mirror, dealing with it day after day, wishing it wasn’t part of my face forever more. I wished it had been anywhere other than my face. Quite a sinking feeling. Two years later, I still get that feeling, but only on rare occasions, and not as strong. 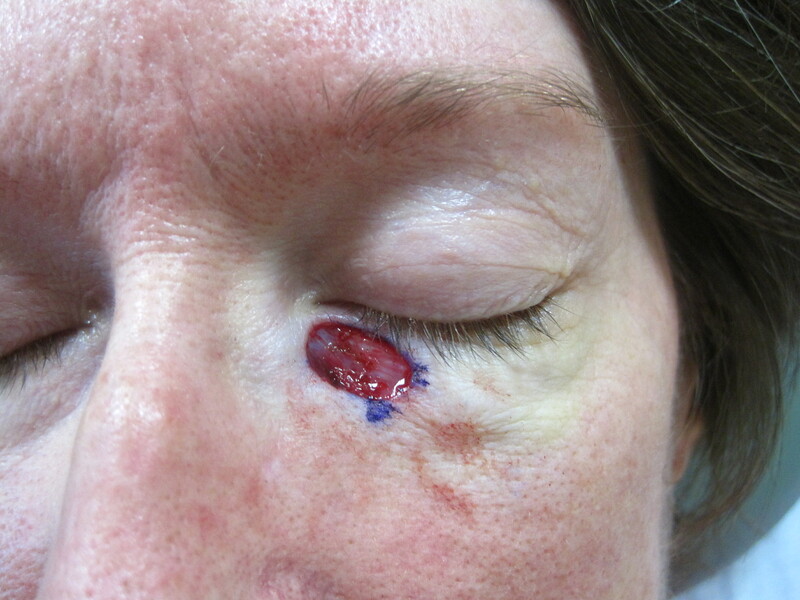 This morning I have just emailed a few other contacts of mine who had MOHS and/or grafts very close to the eye. I inserted a link to your blog. Perhaps they may be able to offer some suggestions for ointments, etc. I hope your new concern turns out to be nothing serious when you see the dermatologist. You’ve been through quite enough. Did you make your appointment with the dermatologist yet? You do a lot of cycling and I enjoyed your recent post of cycling in Tuscany! My friends tell me all the time I should write a book because of all my adventures! Maybe they are right, but who would want to read about my life? 🙂 It’s bad enough they are reading about this! HA! Tammi: Just for future consideration: whenever I have something done as awful and dramatic as this (not often…but it happens….) I ALWAYS ask for Valium, or something similar. Did anyone mention this to you? Before my MRI they gave me an injection. It calms and relaxes you: you’re awake, but no cares. Oh man, I couldn’t have gone through this without “an aid”. You are something. If it makes you feel any better, when I had MOHS on my nose/eye area I put the Bacitracin cream (being a good patient) on the first day and night. Well, turns out I am the 1 in 10,000 who is allergic! My entire eye swelled, was tight shut, and half my face had no feeling! Cortisone to the rescue. So now no Bacitracin ever, anywhere! What is the next step? You wait and see? Let us know how you are doing now; sending healing thoughts your way…. Like moths to a flame……I knew you were 1 in 10,000 too! What a way to find out that you are allergic to something! Trust me, the next time I am definitely getting shot up with a cocktail of sorts. Several days before the surgery, I had mentioned to a friend of mine about getting something to take the edge off, then forgot about it until that morning of the surgery. I’m of the school of thought that mind over matter can conquer……me and my naivete for thinking I didn’t need anything in THIS particular situation. Silly girl, what was I thinking? I won’t make that mistake twice. Ah yes, the next step…..sit back and wait awhile, several months in fact. I have a follow up appt with the surgeon in a month to monitor the keloid but I do believe there has been a change from the injection. It’s not quite as big and a little softer, a miniscule change, but nonetheless, a change in the right direction. I did notice I have a little lump at the injection site but at this point, I can’t be stressing over every tiny little thing that happens because it’s the big picture I’m focusing on. I continue with the massage and hope that smooths things out too. I go back Monday afternoon to my dermatologist because another problem has cropped up right next to an old BCC so here’s hoping it’s not what I think it is and it is my super perceptive imagination run recklessly wild! Ah yes…..Paris…the kicker is that I had every intention of going again this year but had to use my Paris money to pay for these surgeries 😦 Good thing because I would’ve hated to forfeit the trip and deposit considering the complications I am having now. It all worked out and now I have a goal for next year. You know, as I was talking to the surgeon about needles and thread I was wondering if I was distracting him so I kept the conversation light. Good thing because I could’ve very well ended up with a chain stitch or knit one pearl two! As always, thanks for your comments. They always brighten my day! Hi Tammi, I am sorry to hear you are going through this process. It is no fun and hard to understand if you have not been through it. I cannot imagine going through the graft being awake. That would have put me over the edge. I thought it was bad enough when they cauterized the spot from the MOHS so close to the eye and I could smell the burning! 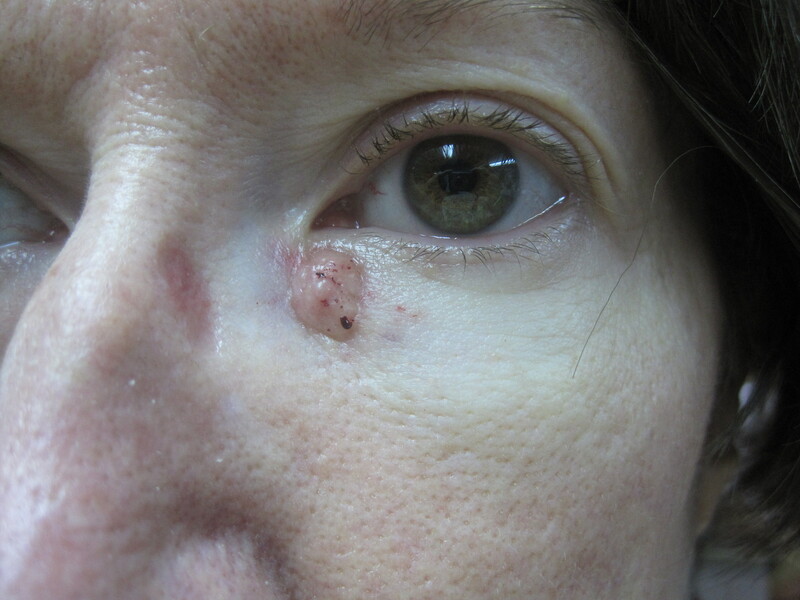 A year ago, I had melanoma in the same spot as your basil cell carcinoma. The open area to repair was 3cm x 1cm so it was pretty large. My plastic surgeon used skin from my eyelids. I was 45 at the time and even though there wouldn’t be any extra skin, he felt he could get enough from my eyelids because he felt strongly that the skin would be the best match. My scar also got puffy. I had steroid shots on two different occasions which helped the keloid. After the initial antibiotic ointment treatment, for the next 9 months, I used pure vitamin B oil on my scar at least twice a day. 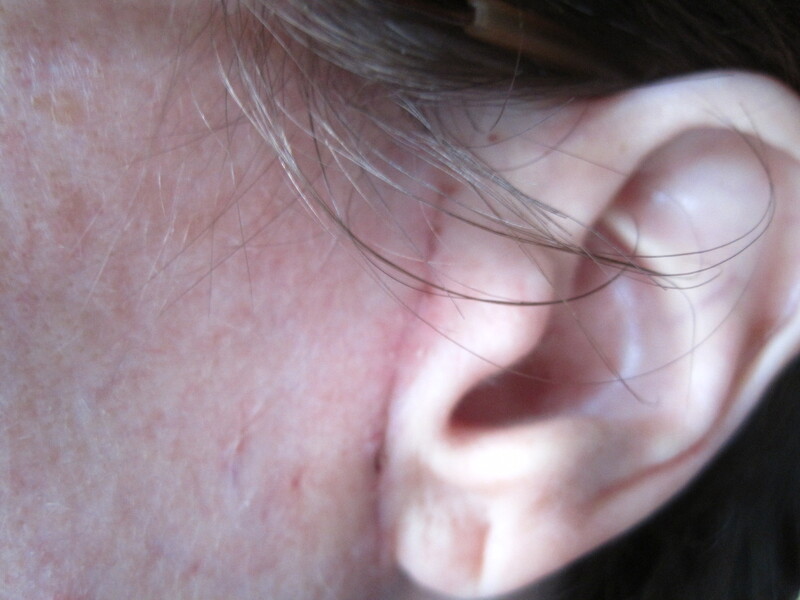 I don’t know if that helped or if I just had a good surgeon, but my scar has healed well. I can still see it, but my friends all tell me it is not noticeable. If you have any questions, feel free to e-mail me. Good luck and best wishes for smooth healing! Thanks for taking the time to read about my trials and commenting. I hate that we belong to this group of people who now have experienced what we experienced, but unless you’ve dealt with this firsthand, it’s hard to comprehend. I have many empathetic friends and that does wonders in the support arena. 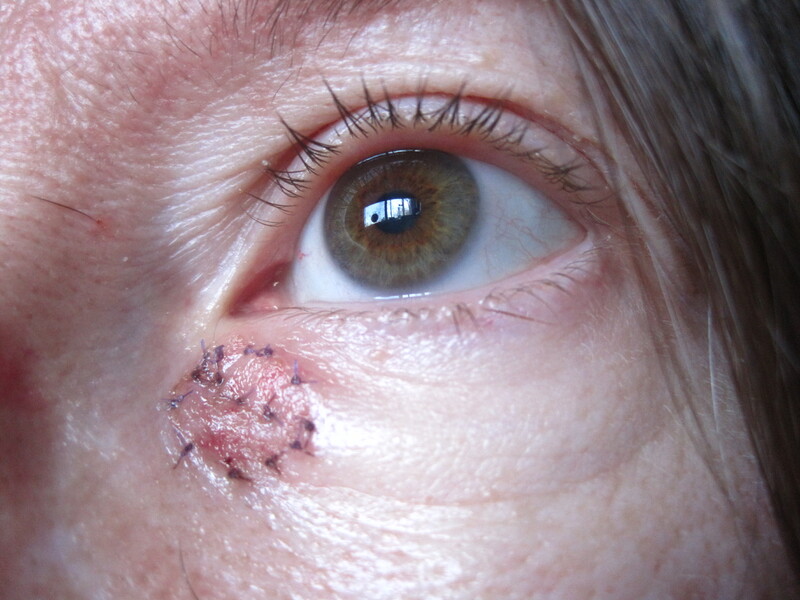 Speaking of cauterization, I forgot to put in my blog that with the first cutting, when the surgeon was cauterizing the area, I FELT it at one of the sides at my eye! Right away she numbed me up again so on top of wanting to throw up because of the smell, I was pretending I didn’t feel what I knew I just felt! We’ve run out of room on “reply” for our last comment thread, but I thank you for sending me some people who have similar ordeals. I’ve had 2 very nice comments thus far and now am not feeling as isolated in my thoughts. You know, I get weepy at the weirdest moments never knowing when it’s going to hit me. It’s always first thing when I get up and I race to the mirror to see if I’ve had any improvement from the night before, then at random moments, but not every day. Tammi: your story was soooo good for me! You tell it so well. I went alone to MOHS because I thought it was nothing to worry about. Driving home with a yellow pressure bandage sewn to my face and no glasses was crazy. I even had time to stop at the pharmacy for pain meds (thankfully given, not asked for–who knew?). My four (4) cats and husband (shocked and incredulous) helped me to bed. I later had to undergo revision surgery due to extreme webbing which is shrinkage of the graft because it is trying to fill a concave area. Asleep again with pain meds later. My doc said the same as yours regarding how often he had seen the webbing I had. He is an ocular and plastic surgeon who asked my permission to use my pics with his residents. I’m now the famous webbed-eye woman. Tammi, you seem to be in the right place emotionally. It IS hard and it feels like people are staring right at the graft. And you feel awful for what you did to your skin as a child and you may even feel like avoiding all sun forever. I am so glad I found Things Happen to help me chart my progress. 1.5 years later and I dont mind my graft so much. I am hyper-vigilant about other spots being cancer. I am crazed over sunscreen. 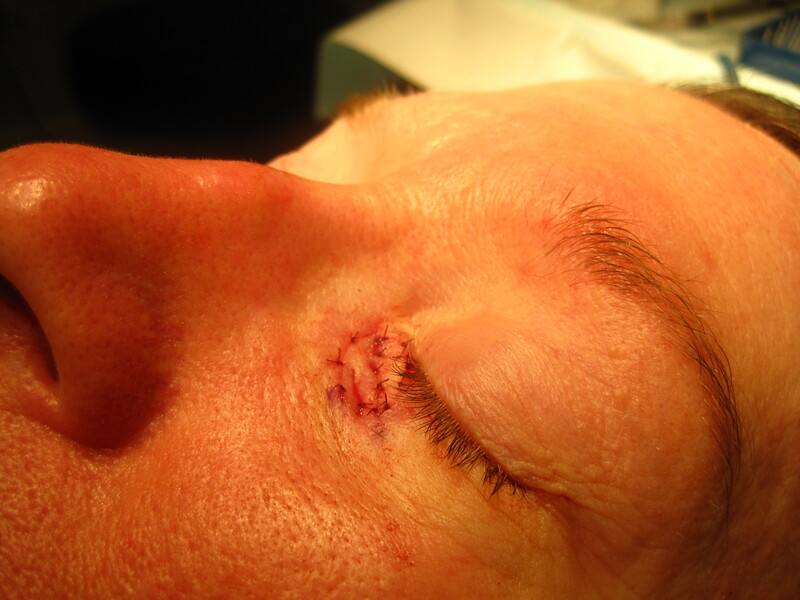 I use Dermablend to blend in the borders of the graft with the surrounding skin. I think I am too old to worry about my looks, but there you are. All in good time, I think. Keep good watch over your precious (yes!) skin and thank you for posting. I’m so glad my story was of benefit to you. When I sat down to write this, my fear was that I would be boring and peope would turn their computer off half way through, or they would think I was seriously nuts. I bared all which is somethIng I don’t normally do, but not finding much of a support group out there, was really hoping this could get a conversation started. First off, I can’t believe you drove yourself! I was told I had to have a driver or surgery would not happen. You get a prescription for pain meds and I get none. I am a tad jealous about that one! 🙂 So my suspicions of a hairy graft are real! At least I’m nearsighted, but needing bifocals makes me just as blind! Would it hurt too much plucking? Oh right, you can’t see. You are in a bit of a bind there. You know, I never considered myself vain because looks weren’t my stronger point, my personality was. But this has thrown me for a loop. Would you feel comfortable sending me a photo of what the webbing looks like? My surgeon did say he had to use extra skin in the graft for that very reason and he didn’t want the skin to be pulling my eyelid down. Maybe webbing is what he was trying to avoid. Yes, I too am glad I stumbled upon the blog Things Happen. Thanks again for commenting and sharing your experience with me. I will certainly send you a FABULOUS “teachable” webbing picture as soon as I locate it among my unorganized pictures’ folder! My friend and manicurist, who is beautifully Asian, agreed that what I had was one Caucasian eye and one Asian eye. She made me laugh when she asked which one I was going to fix! About the driving: I don’t think my derm thought she would be taking so much. OR someone dropped the ball. I didn’t get a referral to an ocular surgeon until after the removal but I was seen later that same day and scheduled for day surgery two days later. All happened so fast I didn’t have time to anticipate, dread, be frightened or prepare to be almost blind for two weeks. Good thing/bad thing. Plucking sounds very painful but maybe there is little feeling there? Can’t do a field test myself since as you said, I can’t see them well enough. Off to find pictures. How shall I send them? Yep, I knew it. I found the picture but don’t know how to send it. (Help desk?) I am on an iPad but I don’t think that matters. What to do? Suggestions? I sent you an email about 15 minutes ago at the address you entered when you first commented. Simply send me a reply with the photo attached and it should work. Technology, huh? My email address began with info@…… check to make sure it didn’t go to spam folder. thanks so much for stopping by and sharing your experience with me. You don’t know how comforting you made me feel about your ear not feeling right for 9 months! I was beginning to wonder if I was just being a softie but I have the strangest sensations on the whole left side of my face, ranging from the burning ice cube sensation which radiates to my jaw to the swelling and soreness that I feel under the skin. It feels like I have been enduring for months but it’s only been 9 weeks! The cold weather doesn’t help either as I feel like I’m being instantly flash frozen every time my head is stuck out the door. The shot I had for the keloid has really softened it up and flattened it out. Still not as nice as right after the surgery but I’m continuing with the massaging and have my checkup this Thursday with the Dr. I will ask about the vitamin E oil and see what his thoughts are about keeping the graft moist as I’ve heard that from sseveral people now and not from him. Probably because I am putting the steroid ointment on 3 times a day yet, we haven’t had the need for further talk. I had another biopsy done on the site of a previous BCC and fortunately it came up benign! 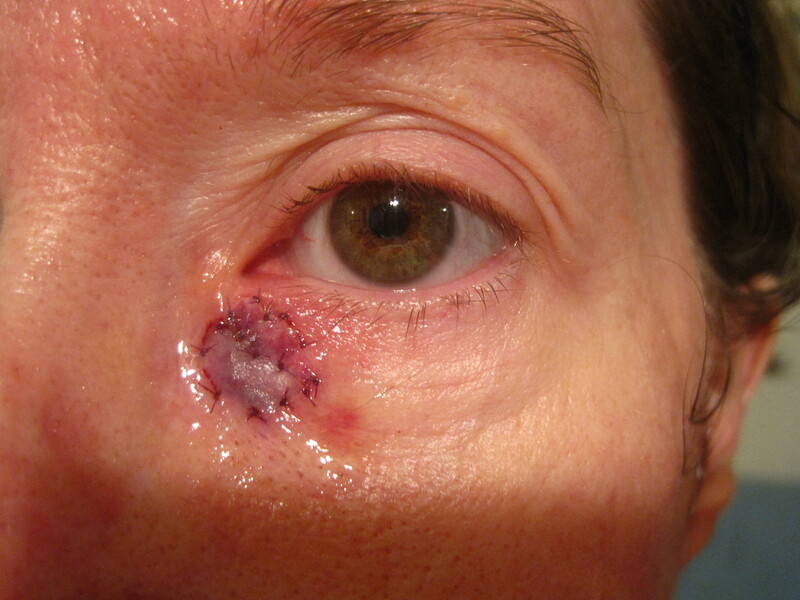 Hello Tammy, I am very pleased to have found a blog like yours about Mohs surgery. I have been searching the web for people that have gone through this surgery to see what is like to be in the position of a patient. I am a Mohs Technician, the person that is behind the scenes processing the skin excisions, then providing the surgeon with slides. Usually patients never see us because we tend to be in another examination room. I read all three of your posts, part I , part II and part III, they were all very detailed on what was going in your mind, which is great to know what your thoughts were when you were in that waiting room. As a Mohs Technician, I don’t tend to socialize with the patients; however, I am always thinking about what their concerns are and if they even wonder about what happens to the tissue once it is excised from their skin. I treat each case as if it were my own grandmother’s or aunt’s. To me not only this is a demanding and fast pace job, but is important and I enjoy helping cure skin cancer. I know it must have been difficult for you to be in that waiting room for hours, just hoping to hear the magic words, “all clear”. When I hear those words, it is great for me too. It gives me a feeling of accomplishment and satisfaction to have helped curing someone. I wanted you to know that there are other people behind Mohs surgery aside from the surgeon and medical assistant. People like me, which enjoy our jobs and care for what happens to the patients in our laboratories. I also wanted to tell you about the amazing posts you have in your blog. They are worth reading for those that will go through surgery or even have gone through it. The detail and personality you bring into them, keeps us wanting to read more. Thank you and hope all is well. thank you soooo much for taking the time to read my blogs. I appreciate all your efforts too and it’s nice to hear from someone behind the scenes. I was wondering who indeed was slicing and dicing in the background reading my tissue and also wondered what happens to the slice when it is all done. Feel free to send patients my way. I have found some very interesting people who have shared my experience as a result of my blogging about it. Did you get a chance to read the 4th post as well? I am overdue for a followup post like I said I would. When the dust settles on my end here, I will be doing another post. Tammi, thank you for sharing your story. I, too, waited too long to deal with my BCC. Before surgery, honestly I didn’t think it looked all that serious and maybe it was just a weird breakout or something. But it didn’t go away for such a long time and I didn’t have it checked out for 9 months or more after it first appeared. Even when I started to suspect that it might be BCC, all the pictures I found online looked so much worse than mine so I discounted it. 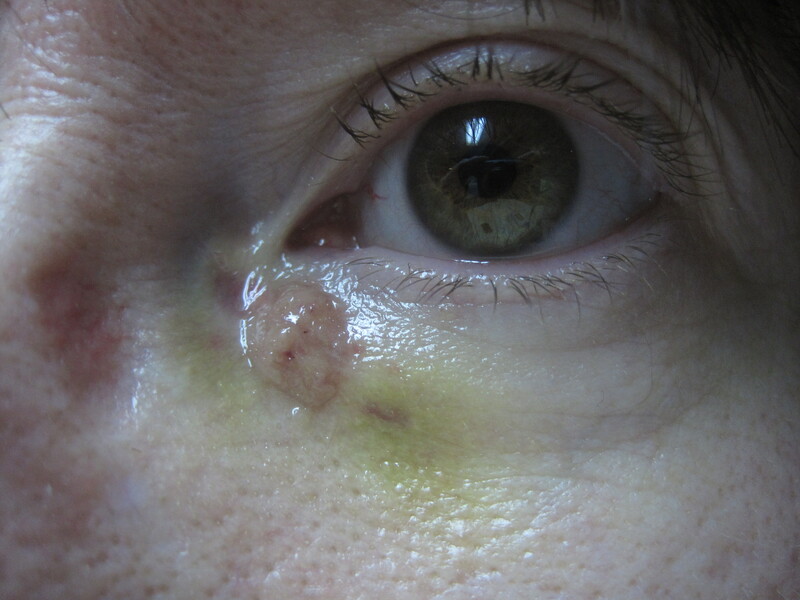 My BCC before surgery, at its worst, looked about like your picture of keloid after injection on the first day. I had a similar procedure about 6 months ago and while the hole after Mohs was probably about the same size, it was a bit closer to my eye. 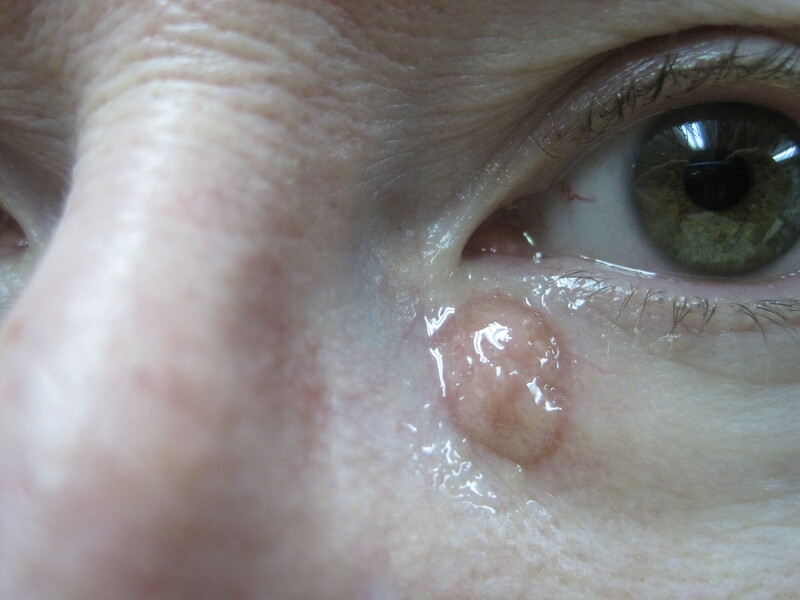 The ophthalmic PS who did my reconstruction said to my husband that if the cancer had grown another mm or two it might have threatened my eye! They numbed behind my ear and I was under twilight anesthesia (*highly recommend to anyone who has the option! *) for the reconstruction. Fortunately, he was able to take a small patch from the outer edge of my eye after all – even though I’m only 33 and he did not think at first that he’d be able to. I did NOT look at the hole in my face before reconstruction. I looked much worse than you right after surgery, with an incision along the side of my nose and under my eye so that he could pull that entire portion of skin closer to the corner of my eye. He also had to do something that required stitches right in the corner of my eye, I guess it was THAT close. However, my recovery was less painful from the sound of yours. My surgeon sent me home without a patch and had me do cold (wet) compress 15 min every hour the first day and then warm (wet) compress after that. It did itch like crazy, and I did take extra strength Tylenol like clockwork. I had my 6 month follow up visit yesterday. 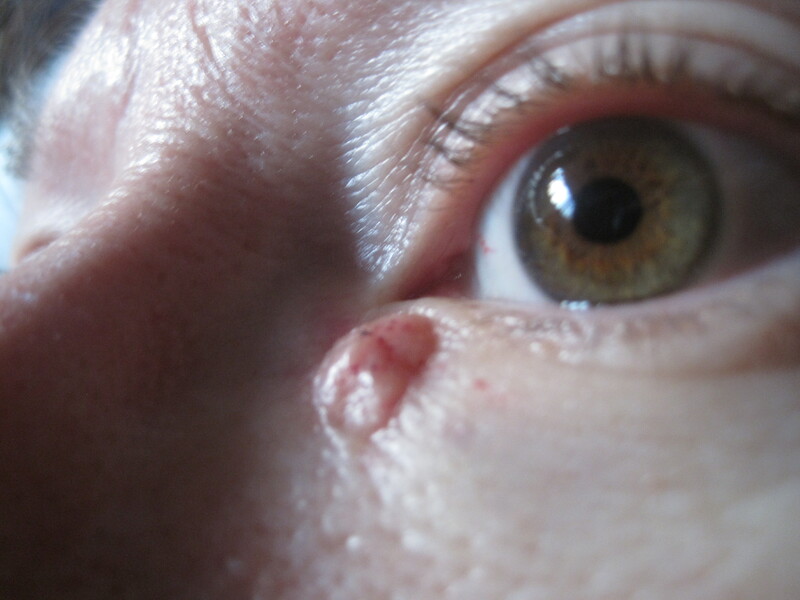 My graft has remained thicker than the doctor wants it to be and I have slight “webbing” in the corner of my eye. If it doesn’t correct within a couple more months he wants to do a revision but I don’t know if it bothers me enough to do that. Supposedly, it would be covered by insurance but if I’ve rolled over to a new deductible it could still be very expensive – plus I’m not sure about another surgery if I can avoid it. 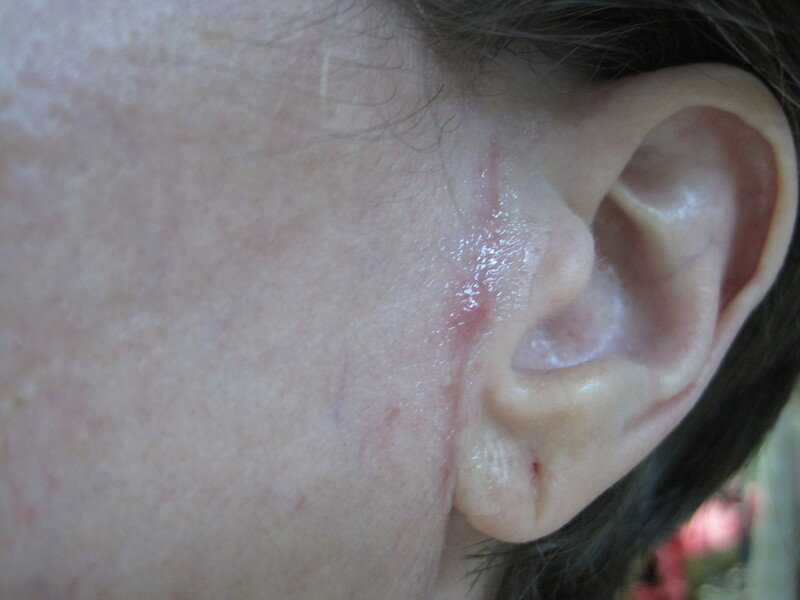 It’s been quite some time since your surgery and the keloid formed…. I hope everything worked out for you in the end, since you did not provide an update…! You have reminded me I need to do a 5 year update! I am so glad you found my blog helpful! I will be thinking of you in a couple weeks. Please let me know how things go, ok? I am always amazed that years later, my blog is still relevant. Which reminds me that I took pictures awhile back to do a follow up post. 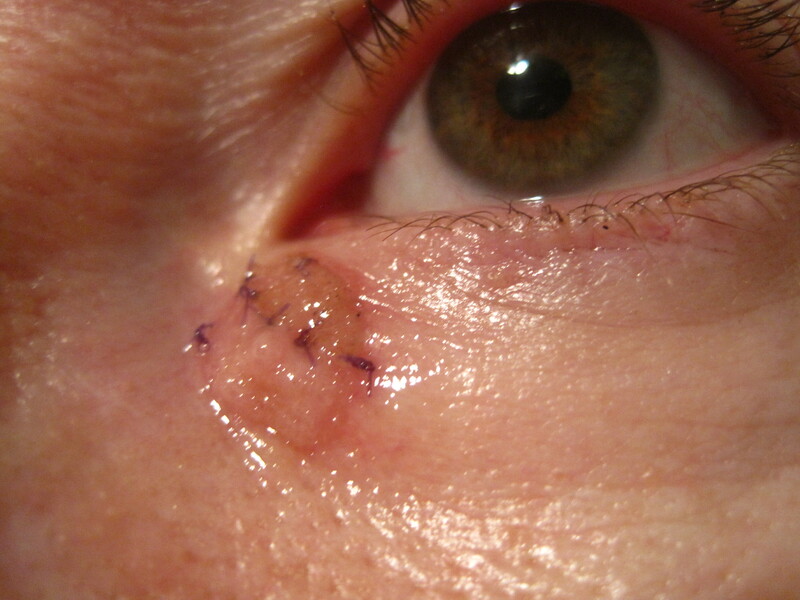 And interesting enough, last week Facebook reminded me of a memory I had of 6 years ago when I first met with the ocular plastic surgeon. That jogged my memory and I will be posting an update when I can remember which file I put those pictures. Take care and again, keep me posted. Your story is my story. My BCC was also near my tear duct. I had Mohs 10/2/2017 and a skin graft took place 4 days later. I was thrilled when the bolster was removed, the graft was beautiful. Four days bandage free the graft looked to be “bubbling”. I went to the plastic surgeon and sure enough a large keloid has formed. I get my first steroid injection November 22. I’m devastate and terrified the steroid treatment will not work. However, I’m grateful and hopeful thanks to your blog.